On our first day in Mae Hong Son, a crazy lady in the morning market realized, as we were inspecting her “for rent” sign, that we were in search of an apartment. She didn’t speak any English, so she dragged us by the arm to a small restaurant on the main road, where she enlisted the help of the chef to serve as translator for our housing negotiation. We decided that her apartment was too far away from town and too expensive, but we took note of the restaurant location and decided to return for lunch. It turned out to be the first of many meals at Som Tam Hut, a new, sparklingly clean papaya salad joint. We learned on that first visit that the tiny restaurant was owned by a pretty Thai woman, Lala, and her Dutch fiancé, Tobey, who was also the entire wait staff. Lala slaves away in the kitchen, pounding traditional Isan-style papaya salads in her big mortar and pestle. We learned later that she also sings at the only nightclub in town, which we still need to check out one of these days. Tobey is a friendly guy, who took an interest in our housing search and our volunteer work, and offered us some advice on places to check out in the area. The menu offers a few varieties of papaya salads, although the most popular is the classic, Som Tam Thai. Lala makes hers on a spiciness scale with choices of: Zero => Mild => Normal => Spicy => Hot. Tobey and Lala were skeptical when we ordered ours “Hot,” but Lala agreed to prepare it that way. It certainly was hot, but also extremely delicious, with chili-lime-fish sauce dressing that dribbled down onto my chin and burned my skin. I loved it. The fresh shredded green papaya, crunchy peanuts, carrots, tomatoes, and secret formula dressing made a perfect combination. It wasn’t the first Thai papaya salad I had tried, but it was certainly one of the best-executed. We also tried some new things: Som Tam Fruit, which is similar to the traditional salad, but made with pineapple, tomato, rose apple, grapes, peanuts, chilies, and the same delicious spicy dressing; and eating sticky rice, with our hands, as a papaya salad accompaniment. The English menu (Thai menu here if that’s your style). I love #2 and #5. Lala’s ingredients are always fresh – Kenny and I often run into her at the morning market – and she is not afraid to scratch certain items off her menu on days that she can’t find high-quality fruits and vegetables. Ever since that first visit to Som Tam Hut, we’ve been telling ourselves we’ll branch out and try new things, but we we are so addicted to the Som Tam Thai and Som Tam Fruit (with a side of sticky rice, of course), that we haven’t actually done it yet. Once when Daniel was visiting we all shared a side of fried chicken, which was, well, fried chicken. It was a bit greasy and seemed out of place next to our healthy delicious salads. We come here so often that we were the first farang to fill up a buy-10-salads-get-one-free card, and we’re well on our way to completing a second. …but then we decided to offer you this. I wish I’d been keeping a journal of all the entertaining translations and spellings we’ve seen in this country. Our lackadaisical, non-committal approach to planning this holiday has backfired a bit already: we decided last night that we were ready to move on from Bangkok to Ko Phi Phi, but all flights from BKK to either Krabi or Phuket were fully booked. There were plenty of flights to Samui, but we aren’t ready to go there just yet, as we have a flight from Samui to Chiang Mai eight days from now. Our Bangkok hotel offered to book us on an overnight bus, but we politely declined. We finally settled on a flight to Phuket through Samui, which is a bit crazy (it’s like flying from Seattle to Los Angeles via Phoenix) and takes twice as long as a direct flight, but it will get us there. The only real downside is that we’ll be arriving in Phuket too late to catch a ferry to Ko Phi Phi, so we’ll need to wait another day. But I suppose there are worse things in life than being forced to spend a day on one beautiful tropical island before moving on to another (high class problems). 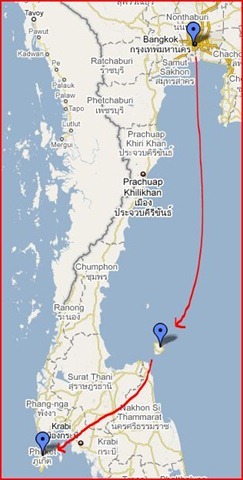 If we like Phuket, we might spend two nights. We only have one day in Bangkok – at least for now, we’ll be here again in two weeks for our departure back to Seattle – so we tried to hit the major hotspots today. We spent the first half of the day at the Wats in the historic part of town – the Grand Palace (home of the Emerald Buddha) in the morning, followed by Wat Pho (home of the Reclining Buddha). We experienced our first Thai massages at the massage school in Wat Pho – highly recommended! We will certainly be getting more – at these prices we could get massages every day. After lunch, we took a cab to Chatuchak Weekend Market, which was huge and crazy and like nothing I’d ever seen before. We weren’t in the market for anything in particular – we ended up purchasing a couple pillow covers and Thai pants – but it was fascinating just to walk through the maze of stalls selling clothing, kitchen appliances, food, puppies (! ), and just about anything else you could imagine. Papaya salad stall at the weekend market. Arrive BKK after an 8-hour layover in Hong Kong. Check out the city for a day or two before heading to the beach. Fly to Krabi. Spend a couple of days of beach time in the area — either in Railay or Ko Phi Phi or Ko Lanta (or perhaps split our time between two of those three, depending on time and transportation options). Fly to Ko Samui for more beach time on Samui and/or Ko Phangan (but no Full Moon Parties for us — we’re way too old for that). Fly to Chiang Mai. Either do some trekking or a day at the elephant farm if it’s not all booked up; maybe a cooking class. We’ll most likely be in Chiang Mai for New Year’s. If we have time, I’d love to see Sukhothai. But I don’t know if it’s too tight of a squeeze (if we had another day or two I’d also love to squeeze in a side trip to Ayutthaya on the way back to Bangkok. But I don’t think it’s going to happen). Head back to Bangkok and fly home. The flights from Krabi to Samui, and Samui to Chiang Mai are already booked (had to book those this past weekend, as all the direct flights were booking up, and we want to avoid flights through BKK as much as possible). Nothing else is, but I’ll probably grab a hotel room for our first night in Bangkok before we go.